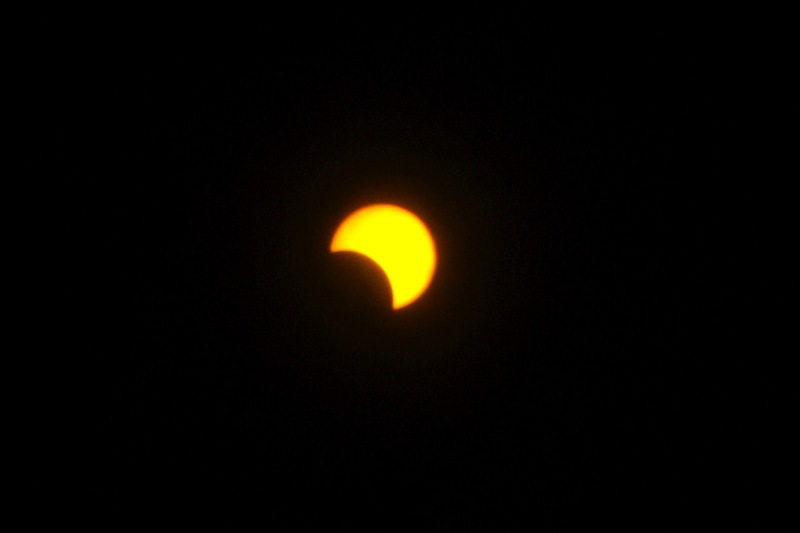 On the early morning of the 21st of May we,in Tokyo, would be able to see an annular solar eclipse for the first time in 173 years so we were alive with the excitement. School children gathered at school at 7 am and held observation meeting. 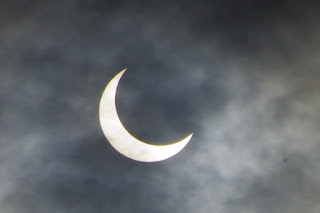 The weather forecast of that morning was cloudy but they said we would be able to see eclipse among the cloud. Blessed with cloud I could take photos without filter. I think these are very fantastic. At that moment I could see nothing through the eclipse glasses because of cloud. This glasses were made of paper but these were 315yen,too expensive! It is the photo when I took it through thick could. Under thin cloud I took miserable photos because of overexposure. At 7:35 am, just the time of the annular eclipse cloud became thin so I used filter. I got a photo of gold ring but it was conventional photo. At that time my thermometer has fallen by 5 degrees and cold wind blew. The official announcement said 1 degree down at that time. I measured it on the lawn so there was nothing for keeping temperature. I think it is the reason why to fall temperature so big. And sun came back. At the moment of full eclipse I did not feel darkness but many crows that always made noise at the twilight around my house cried so loudly. I regretted not preparing a tape recorder but too late!